On my previous posts on fixed deposits, I have been repeatedly asked for current rates as there is a lot of conflicting information out there. As a result of this, I have contacted a few banks directly in order to get current fixed deposit rates. The rates provided below are valid as at 16th of February 2016. Recap: how do fixed deposits work? You will need to have an existing account with the bank of your choice, and then you deposit the sum you want to fix into this account. You will then need to inform your bank of your intention to “fix” the said sum for “X” number of days. 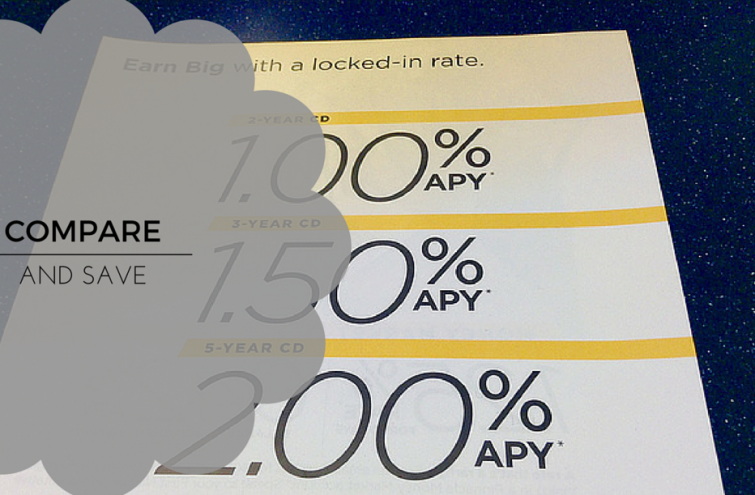 It is very important that before you make your decision, that you shop around for the best rates. The money to be fixed is removed from your account and the interest is paid into your account monthly. So for example, you want to fix ₦500,000 for 60 days and the bank has offered you an interest rate of 7%. You have ₦550,000 in your account. Once you confirm you’re making the arrangement and sign all the necessary documentation, the ₦500,000 “disappears” from your account to be “fixed”, leaving you with a balance of ₦50,000. 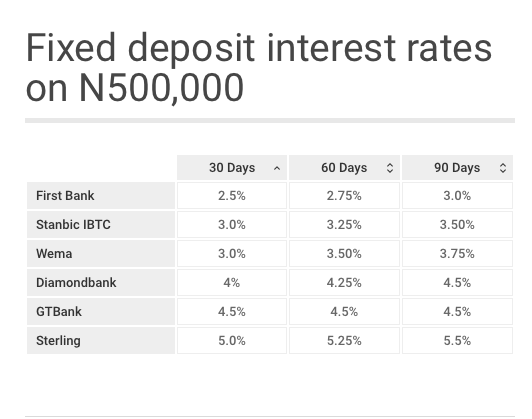 After 30 days , you get ₦2,625 interest paid into your account: [(7% x ₦500,000) / 12] – 10%. After another 30 days, you get ₦2,625, again plus your initial ₦500,000. That’s it. It looks like Sterling bank offers the most competitive rates for now, but it’s a good idea to always check before making a commitment. Am I an agent? I work for neither of these banks. My selection of these banks is purely by chance and accessibility of contact information via the bank websites. I simply picked the banks with the most prominent contact information via websites. My reviews are unbiased, and if I haven’t reviewed any others yet, don’t worry – “life is turn by turn”. Thanks sir, you really helped! Comment above me made me biased in certain issues about the post.. Are the rates mandated to 5 hundred thousand and above or what? ?